In December of 2016, Trail was looking for ways to save money and took a hard look at the Thousand Trails camping pass program. If you are not familiar with them, they are a membership club for RVers where you pay a fixed membership fee, and can then stay in Thousand Trails parks without additional charge, and in affiliated parks at a reduced rate. They were having a sale where they offered two zones for the price of one, around $550. This would let us park anywhere in their eastern territories, which is exactly where we planned to be over the next 6-8 months. Their pitch is that for one low price, you can camp “all year-round” at any of their beautiful parks located in some of the most awesome places in the US. What’s not to love about that? Well, a fair bit it turns out. After 8 months of trying to make use of our TT membership in the Southeast and Northeast areas, our experience with it is decidedly mixed. I’ll break it down for you and then get into the details. The bottom line is that if you understand how they work, and can do some planning, you can get a pretty good deal out of it, but you will be limiting yourself to some mediocre parks in limited locations as a result. Tightly packed campers and iffy dirt roads, pretty typical of Thousand Trails for us so far. Let’s do a swimming pool theme in honor of this photo. The first gotcha of a Thousand Trails Membership is that it is designed to keep you from simply living in their parks full time. The longest you can stay at any one park is 14 days at a time. Furthermore, after any stay of 4 days of longer, you will need to wait at least one week before you can stay in another Thousand Trails Park. So under ideal conditions, you can stay in TT parks about two-thirds of the year. But it gets a bit more complicated. Camping at TT parks is on a first come first serve basis. You can book in advance but popular parks in popular venues will fill up pretty fast well in advance of the peak season. Sometimes you can get reservations on a given date, but only for a fairly short time. If there is some mistake, and you show up to a full park, you are more or less out of luck. That has not happened to us, but we have read of it happening to others. Finally, most of their parks are in tight clusters in certain parts of the country rather than widely spread out. Unless you are planning your trip around their parks, there is a good chance there won’t be one in the location you want to go to. They are also divided up into Zones: North West, South West, North East, and South East. A basic membership is for one zone and you pay extras for more. Thus you get the best deal if you are strictly a regional camper. The middle of the country, most notably near many of the big national parks, is completely bereft of Thousand Trails parks. Put all these factors together and it can be tricky to take full advantage of your membership. With our one year membership, and being on the road full time, we will probably end up spending only about 20-25 days in TT parks this year. The main reason for that is that they just don’t have parks in many of the places we want to visit, but their week-between policy has meant we had to skip a couple TT parks because we were in our blackout period when one was near by. Despite only spending less than a month in TT parks of our one-year membership, it was still a good deal from a pure-price perspective. If we only end up with 20 nights in TT parks, our $550 outlay means we got to stay for an average of $27.50 a night. Considering the average parks in the East are $45 to $50 a night, that’s a good deal, saving us about $350 to $400. If you are a strictly regional camper or can plan your adventures around the park locations and availability, you can save a lot more, especially in places where the prevailing park rents are high. I have not been to the majority of TT parks, not even within the North East region where we spent a majority of our time. But so far, the Thousand Trails parks we have visited have been mediocre at best. Compared to other parks we typically stay at, they are a little below average. Because we often try to find nicer parks to stay at, the Thousand Trails parks are among the bottom fourth of those we’ve stayed at in the last 20 months of traveling the country. The most common problem is that the parks are fairly old, and not much money or effort has been invested to keep them up. The two ways to make a park nice are to have new infrastructure or to take good care of the old infrastructure. Those in the TT network seem to do neither of these. They have old facilities and only do the minimum necessary to keep them running. Bathrooms are often bedecked with dead bugs on the walls, cobwebs in the corners and mud on the floor. The shower fixtures are old, rusty, and heavy with mineral build up. Odors of mold and mildew are fairly common, sometimes overwhelming. Overall they vary from, just adequate, to outright disgusting. I’ve yet to see a bathroom in a Thousand Trails that impressed me with its cleanliness. The quality of parking spots varies a bit more. Some TT parks have had pretty nice lots with plenty of room and fairly level pads. 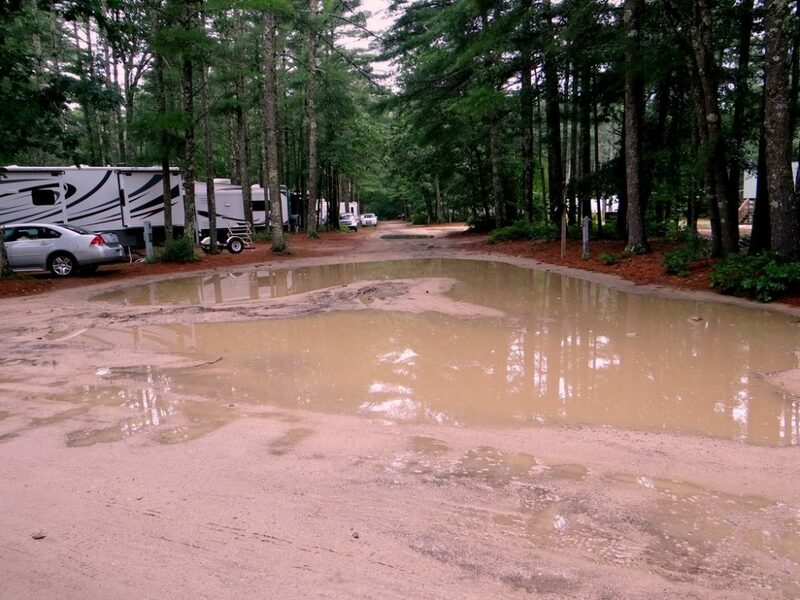 Others cram the campers into tiny spaces on tiny roads in sites that are lumpy with tree roots and potholes. We’ve never had an issue with the actual hook ups, but then again, I can say that of nearly every RV Park I’ve stayed at in more than a year of constant travel. The lack of a good reservation system is also irksome. Often you will have to roam around the park looking for an open spot with a map that tells you which empty spots are not to be taken because they belong to someone with a year-long lease on the spot. Then you have to report back into tell them where you parked. 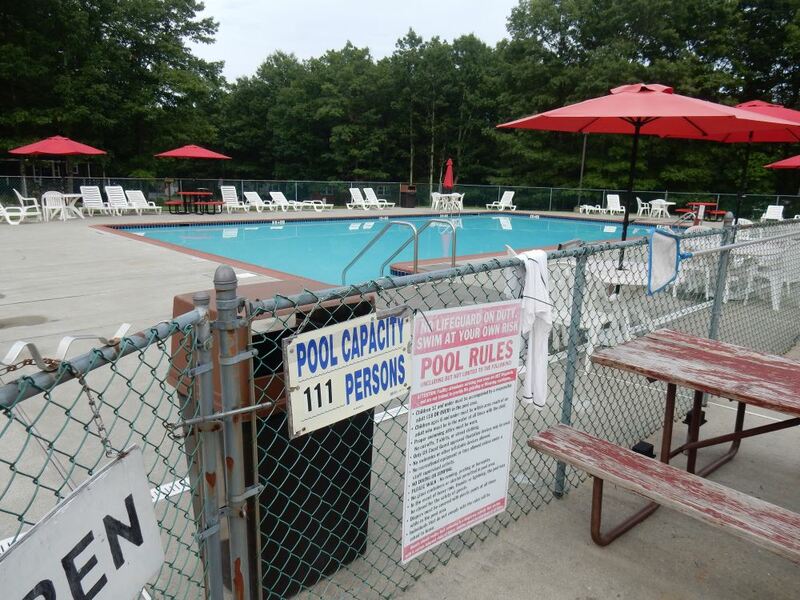 I’m thinking 111 people might be a bit too much for this pool. Just a hunch. I ask because Thousand Trails operates a lot like a typical timeshare company. Most of the parks will have a sales person that would be “happy to meet with you and explain all the wonderful upgrades available for your membership.” The contract terms change from year to year and there are all sorts of special types of memberships you can upgrade to. Older memberships are also transferable and there is a sort of gray market on these old contracts that have different rates and terms. I get the distinct feeling that it’s all a bit of a game where TT is trying to get the most money from you and you are trying to get the most camping from them. They want you to think you can beat them at the game and score a great camping deal. But the truth is, they have a fixed cost in the campgrounds and so they are happy to see you upgrade your membership as much as possible. Ultimately your ability to camp is limited by site availability. We just opted for the basic membership and have done our best to avoid the sales people. They don’t go out of their way to find you so that’s not difficult to do. They have a money back guarantee, but it’s pretty limited in scope. If you hate your first two days of camping you can get reimbursed. Commit to any more of that and you are keeping your membership and they are keeping your money. If they catch you breaking park rules or cheating on your stays somehow, they can cancel your membership with no refund. I’ve not heard of them using this abusively, but it’s worth keeping in mind. Once you are a member, they have more control than you do over the relationship. One of the three pools in the park. All were pretty nice, some larger than others. Probably not, but I wouldn’t entirely rule it out. If I was planning on being in one of the regions where they have a lot of parks, for an extended period of time, then I think I’d get a regional pass and take advantage of the savings. I think if you get to know their parks, you can pick out the best ones and how to take the most advantage of what they offer. For me, the freedom to go where I want and when I want is often worth paying a little more for. If I really need low-cost parking, then booking by the month is often comparatively cheap at parks in more rural areas. 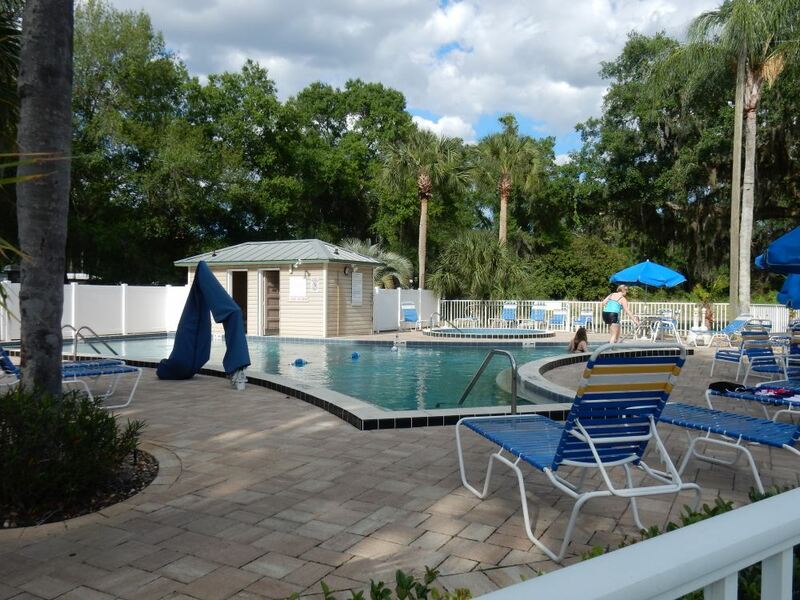 We’ve stayed at some wonderful parks for as little as $15 a night when paying a monthly or weekly rate. Don’t believe the hype their sales pitch gives you. Make sure you understand the limitations of membership and have a plan for taking advantage of it if you join. Set yourself a target per night price you want to achieve and figure out how many nights you need to stay in the network to get that value from a given membership price. If you think you can manage to stay that many nights or more, and it fits in with your travel plans, then it could well be a good deal for you. If quality means more to you than price, stay away from Thousand Trails as there are many better parks out there. Thanks for sharing your experience Jim. The sales tactics are definitely not to my tastes. Also, your blog pointed us to Passport America which for some reason I had been ignoring anf at $44/annually its a steal. I will be joining that club. I’m glad I could help by sharing our experience! My parents bought A Thousand Trails membership back in the 80s. I personally had some great times at several of the parks throughout the years. After I had a family of my own, I too bought a membership. I have to say I’ve been very disappointed the last few years. I’ll go back to the early years of my experiences at the parks. It was a family oriented place. The slogan was ” We are family”. They were very clean parks. The rangers knew most of the campers it seamed. Most everyone was friendly. Most people were respectful to each other and their surroundings and the restrooms and the parks in. That being said they were no nonsense. The 5 mph speed limit, the noise pollution from peoples cars and boomboxes, and the curfew were seriously enforced. I don’t like driving 5mph but I do. I get it. There are kids everywhere. On foot, on bikes, on scooters, and skateboards. Kids do unpredictable things and are often not paying attention. I like to listen to music loud but I don’t in the parks because its inconsiderate to other campers trying to relax and enjoy their weekend. I have seen people kicked out of parks for not following these rules. Fast forward to the last few years. First off, when I bought this membership the parks were exclusively for members. Now the public is welcome. It’s been harder to make a reservation. That’s good for the company but not good for the members. If I was out of town and wanted to stop, I could pull into a Thousand Trails and get a site for the night. The couple times I’ve tried that as of late there’s been no sites available. Also I would say about 5 to 10% of the cars that drive past my campsite are doing under 10. Even the employees often are driving too fast. This last weekend, only once did I see an employee ask somebody to slow down. My previous camping trip a several months back. It got so bad the sheriff came to the park because the people next to us would not turn down their music and stop laughing and yelling well past 3 a.m. It was a large group who were not members. An employee tried to get them to be quiet but they ignored him several times. I yelled at them around 1 am and they ignored me. I’m all about having fun but there’s a time and place for that kind of fun. Thousand Trails is not one of them. I’ve always had plenty of fun at Thousand Trails Parks without being obnoxious. This is not the Thousand Trails I grew up going to. This is not the Thousand Trails I bought into. I am considering selling but I know I won’t get anything close to what I put into it. 1) new owner is Equity Lifestyle —they have been ruining the camps and camping experiences, worse daily since they took over. —Park staff/mngrs are prevented from enforcing rules other than the violent events that require the sheriff. They are pretty good at knowing when sheriff is needed, and do not need corp approval to do so at the parks.—the other events, rule violations, generally are ignored until they escalate to needing the sheriff. We were at a TT this week, the entry ranger station had 3 vehicles shoot like bats out of hell down the road between sites , going 15-20mph one after the other. No one paid attention. They are “prevented” from enforcing most “rules” because “Do Not …(enter occupied sites, enter one way road, park on the empty site/grass, etc.) is, and I quote “only a suggestion” .—Equity has determined that the only, and I quote again “thing it is interested in is that the stay reviews (link sent after every stay) on Trip Advisor be “excellent”…while effectively neutering the staff from enforcing the rules that TT/Equity corp set up. Think it’s not an issue? Think again! Our site had 40-50 people per day walking, running, riding bikes (fast, much > 5mph), carrying their laundry & trash, throughout our site, the 4 sites on either side… despite staying in the road only being another 30-100 ft walk! Yeah, the same people who walk up and down the whole park, walk the mike to the pool, bike around town, etc., for their own enjoyment cannot manage to stay on the road otherwise and not degrade the enjoyment for rest of us. 2) The whole point of paying the big bucks was to have the “same rules, different park”! 3) Staff is limited to what corp will allow budget for, not under the control of managers… neither are repair or upgrade/enhancements budgets. 4) TT is based on nature preserves, leaving the natural resource beauty as much as possible. Great, in theory. After all, we did not desire to go camping in the gravel parking lot that is the TT Las Vegas ‘preserve’, did we? Some TT are actually old Leisure Time or NACO camps. All, it seems, are from bygone eras, when RV-ing was a pop up or small travel trailer. There is a lot of upgrade needed to meet the rapid growth of big trailers and Class A’s that seems to have exploded in the past 10 years… the sites that were adequate for tents, small trailers without need for sewer, were for their era. A lot of other (private and corp like KOA) camps have similar upgrade needs to meet current demand. —-but they don’t get paid $10k fti be a “member”! 5) Camping, just like general society, was about neighborliness, respect for others, the rules, and the common environment. None of that is true today. Clearly TT writes lots of rules … almost none are enforced, except God forbid someone somehow has 1 too many days , reservations, perks. That will be dealt with by an iron fist, even if no fault of the camper due to rez error by the call center. 6) The nice guy next to us had to peel me off the roof when the worker pleasantly informed us that due to where our site was located, the remainder of our rez would be hell because they cannot enforce the “Do not enter other people’s/occupied sites” rules that is in everyone’s handouts at every park AND in all zone/member lust of TR rules , since their direction by mngmt has been that “Do Not…” is only a courtesy request not a mandate. Now, I have 2 advanced degrees and am just nearing my doctoral degree, but even in grammar school we were taught that “do not…” is a definitive statement not open to interpretation, no gray area for negotiation, and NOT a suggestion but rather a direct notice of what is NOT allowed. In our 1st 4 hours, > 40 ‘people’ traipsed through our site without a hi, is it ok, etc., but with PLENTY of attitude when asked to go back to the road and not go through our site again (which several did regularly anyway). Yes, thinking of dumping our membership, as well. 8) TT zone and membership each have a contract signed by both parties. A contract is supposed to be binding, and under contract law, interpretations or gray areas must favor the party ( buyer) who did not write/have input into the contract. TT/Equity is contractually OBLIGATED to enforce the common rules it put in place to make the environment buyers bought into. Yet, this obligation escapes TT/Equity corp. The lack of enforcement that has degraded the enjoyment of the preserves to intolerable, has NOT escaped the members. 7) TT has some parks that do have overflow space, so if you drive in w/o a rez and no RV space is available, they will allow you to stay within the (relative) safety of the park confines rather than having to find a rest area or parking lot. Some have quite a bit of land that us to be later improved, others have no overflow space. Calling is best. It is available to members; unsure if it applies to zone pass holders, although if they have the days available within their contract, it would make sense they would be allowed. I assume, since we’ve never used overflow, that it would go ‘against ‘ your tally of ‘used’ days. So, if your limit is 14 days, you stay 1, you have 13 days remaining if you were heading toward a TT destination where you had a rez. Yea…..you only mentioned one type of TT membership…. We stay 21days and can go right to the next tt park…..we book 180days out very easily on tge web site or on line and on the phone……we are full time. You need do tell the full story. To be fair, its the only type of membership they offered us or sold online when we signed up. When talking with TT campers in Florida we learned about all the other sorts of memberships they have and the secondhand membership market. I appreciate you mentioning the other options, I’d tell that story myself but they don’t make those other membership types public – that I know of – so I don’t know any of the details about them. And you’re ignorant. 1)He spoke of the capability to drive in and get a site when circumstances were of immediate need. You are speaking of 12o day advance availability. Apples and oranges.2)He spoke of his membership, not a zone pass which cannot be ‘sold’. Your statement is Irrelevant, regardless, because he was not discussing advance rez time frames (refer back to my point #1. 3)Neither the phone not the website rez allows for same day. Rez can only be made for next day. Again your statement was irrelevant. One can call the park directly for same day availability, presuming one has the direct phone # with them. 4) You “need” to read what is written, and make sure you can comprehend it , before attacking him on … esp. when the attacking is on what he DIDN’T say. Stayed at the St Clair Rv Resort in St Clair, Michigan. The campground was run down, dirty, pool shut down, dirt roads was dusty & very rough, game room had no accessories for pool & air hockey, no TV reception staff over books park, lied to us several times about our camp site, we damaged our rv when the staff shoved us into s 20 amp instead of a 30 amp as was reserved for. Park managed & staff employee Melissa was the worst of the staff. 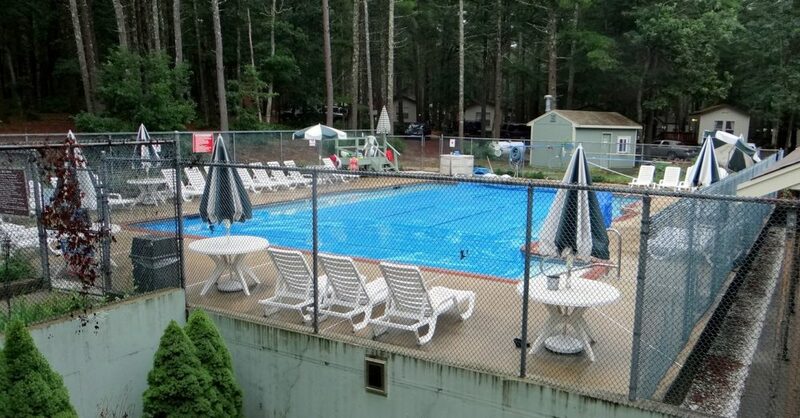 I would stay far away from this rv resort it is owned and operated by Thousand Trails. This experience ruined our vacation we wasted 2 of our 7 days waited around for them to serve us. Yikes, sounds terrible! Thanks for putting the warning out there for folks. I’ve spoken wit them and they were very clear on reservation policy when I signed up the gurantee you a site. They do not gurantee what type of hook up you will get as they are chosen on arrival by you based on availability. The pool is brand new and is going through renovations. There is even talk about expanding the park to create new sites. Sorry to hear you were misled but I am certain they did not gurantee you a 30 Amp site. Unless the just changed their way of doing things last week. I thought the park manager was very polite and honest to me. Patty even provided specific examples of when and when not to come and expect the cream of the crop site Pickens and made it clear they cannot turn away a member even if it means they have to put you on a standby site waiting for one to open. While waiting I experienced them going out of the way to accommodate a camper that just came in and was meeting someone else there. I’m going to start camping there very soon. I will provide an update if something changes and differs from what I was told! Always call the camp directly, ask what they have. All we’ve been to /called have told us all sites are 30amp, and some 30/50 amp, but a couple have identified having some 5O amp avail (not saying if 30/50 or just 50). We carry adapters for 50–>30, 30–> 15, 30–>50, just in case. Many 30 amp sites also had a 20 amp socket, which most older pop ups used. You can tell them whatever you want, sites are still 1st come 1st served. They are very specific when selling a contract , booking to tell you they are not reserving a specific need/request. Hi, thank you for the great info on TT! I am a remote worker, and use gotomeeting and Skype all day for my meetings. My husband and I are heading out in June to the full time life, and my biggest concern is cell service for work. I won’t use the park’s wifi, I will have jetpacks with both Verizon and AT&T. My grandparents are transferring their TT membership to us, if we are interested. I haven’t read much about cell service in their parks…anyone have tips, comments, opinions on this based on their experience? Thank you!! My experience with cell phones in parks has been mostly good. Nearly every park we have been to get’s at least a decent signal on at least one major carrier. Verizon is usually the best, followed by AT&T. It can help if you get a signal booster. They work best if you can mount an external cell antenna, and then put the booster in your RV. It doesn’t make a huge difference, but it does help some with cell-internet connections. Park WIFI is almost always fairly bad, so you don’t want to rely on that if you can help it. One problem at big parks is that in the late evening, the cell towers can get overloaded and there isn’t much you can do about it. In those cases, you want to try and get your online work done before it gets dark, or late at night. When people come piling in from their days adventure, they like to jump on line, watch movies, etc… and it can overload systems. It’s a big problem with the park wifi, but only a very rare issue with the cell networks, none the less, one we have encountered at bigger parks. Thank you so much! I was reading so many bad reviews that cell coverage in TT parks was bad, so this makes me feel better. I have also looked into a booster, which is something I should do regardless. Thank you again, I really appreciate the feedback. Depends on the density of the tree canopy, the surrounding area landscape (mountains), and distance from cities/towns/interstates. TT Pio Pico has absolutely no cell service for any carrier. Drive 2-3 mi, sit on side of road in between mountain peaks—- good signals for major carriers. Great in town, 10 mi away…which is where you’ll want to go to get groceries and supplies and gas! Great town—has pretty much everything you’d want. Internet is an issue, but the lodge WiFi is pretty reliable unless their satellite goes out. No one can really watch movies, since the chairs are uncomfortable and you sit at a folding table meant for you to do computer work/minor business. The cabins come with free satellite TV. No one else is parked close enough to access the lodge WiFi from their rig. At the least, I am very disappointed in Thousand Trails. About 15 years ago, my wife and I purchased a basic Tousand Trails membership. Over the years we have upgraded the membership, ending up with an Elite membership. Having reached old age and do not travel anymore, we have decided to sell our membership. We have invested about $12,000, not counting annual membership dues. Because TT has degraded what it takes for membership, much to the detriment to their present members. After consulting with a company that sells memberships, I am told to sell my membership, I have to pay a $750.00 transfer fee. Plus, my membership at this point is only worth $2,000. So, buyer beware when you spend a lot of money for membership in Tousand Trails! I’m in exactly the same boat! We’ve upgraded to Elite status as well over the last 15 years. Now with an ability to actually travel, I find that there are too few Thousand Trails Resorts available and have to pay the $50 a night to stay at an encore Resort. I’m beyond aggravated. I called Thousand Trails and spoke to Monique, the lady with the Furious attitude who treated me like I was less than a dog. Thanks for the tip, Kenneth. I’d not heard of RPI before, I’ll check it out. Yep, that is her. Affirmative action recipient, it seems. Try selling it on your own, you can get more, and gave the price +transfer fee. And the Elite benefits transfer once, so the buyer gets ALL the same benefits… someone would kill to buy that now-$8k package for $4-5k, and maybe entice by splitting the cost of transfer fee. Beware of Thousand Trails so called “assessment fee” that covers “Increases in insurance premiums, utilities and taxes”.. sounds like a load of horses! @t…they get $550 from me EVERY year… they said I’d I don’t pay it my account would go into collections and I wouldn’t be able to camp. Thanks for sharing the heads up! I get annoyed with any operation that isn’t straightforward with their pricing and charges. The assessment fee was <$75 in 2018. Your annual member dues are NOT an sssessment, and are set in your contract. Some contracts, if not all, have a possible (always!) annual dues increase clause. This year ours was either ~$18 or $28. In retrospect, rather than increasing our dues by $75 more, the lesser increase will benefit us when we initiate the ‘dues increase freeze’ clause at age 62. However, we are very angry that we did not get verbal notification of this assessment that occurs yearly, and has no cap, but also that we did not catch it (not that we could have negotiated the point). But, TT needs to do some fees-based Services that are causing some of the increases that members are being forced to pay as an assessment. We see people hauling electric motorbikes and toys, drive electric cars, etc, that they are recharging at their campsites besides all the electric used by their rigs. We shouldn’t have to pay assessments so others do not have to pay for their ‘fuel’! There should be a purchased token, similar to purchasing the 1 day/1 time car/rig wash permit from the camp office. why should the rest of us pay increased dues and special assessments for others to use electricity that is not to run their rig? The cheapest electric car recharge is ~$4/charge on a 129 socket~30%less on a 220. — the most expensive is ~$9-12—-depends on utility rates. And they charge their cars every 2-3 days, more if they go on a day trip! As far as the park conditions, they vary. The more rustic are actually more appealing to me. I am camping after all, even though my rolling home is better than a luxury apartment. I research every park I stay in on either Google Earth or Google Maps in satellite view. I can see exactly how much room a site has, and many other things like the location of the utility post when you zoom in. I do use the bathrooms, but sparingly like when I am on a walk and need to use one. The bathrooms are generally clean. Once in a while the weekend warriors overrun the bathrooms and leave a mess or use up all the tissue. That happens in the best of places. Now the good news for me. I use a standard of $30 per night as my base for what I save. Over the 7 plus years of my travels I have saved $37,000 dollars above all my Thousand Trails membership and dues costs. If you are going to tour the west coast of the USA, you can save a lot as that is where there are many many Preserves. Arizona, Texas, and Florida are now great places to use Thousand Trails membership along with the Trails Collection. Even without that collection I managed to spend only a bit over $1000 including my dues from October 1, 2016 to October 1, 2017, that expense was for one night stays while travelling long distances and a couple extensions to visit friends or relatives. Because of the Hurricanes this season I have opted for a very inexpensive park in Texas for a 4 month stay. I was concerned that the many parks in Texas and Florida that were decimated by the Hurricanes would overtax available spots on warm places. Thanks, Jerry. It’s good to see just how much you can save over the long term with them. Most of the folks we met in the TT parks were pretty happy with their memberships. I think what you were saying about studying the parks and picking sites is a good example of how the more you put in effort into figuring out how to make it work for you, the more you get out of it. Thanks much for sharing your experience with our readers! I’m sure folks appreciate it. its nice to see a nice comment we have been members since 2006 and have enjoyed our parks. some are better than others but that true every where. i find there web page good i make reservations and if i cant make it i cancel the day before. one year we used tt for 266 days. it is like a timeshare but if you learn the system its not two hard. tt also guarantees you a spot mind you it might be overflow . last summer i made a reservation but i needed an extra 7 days. the resort checked every morning for me and let me know i could keep my spot. Thanks for sharing your experience, Gerald! I’m not sure if I mentioned it, but the reservation website was one thing we did like about 1000 trails. Many small, independent RV parks don’t have full online reservation systems. Encore has an online grid, similar to hotels, that can be invaluable for knowing availability of days. It is not, however, available to TT -ers who have the TC, the TT antiquated system of blind hit/miss when put dates in still is used. The TT camps & rez center see the grid, though, similar to an appointment book it shows them days available. The downside is while you cannot make a site-specific rez, the grid is designed for it— meaning there is availability but the online rez system tells you there is not. So if you call, the rez center can see “Site X has 4 days avail, then Site Y has 3 more days avail, then Site Z hAs 7 days available, so yes, we can reserve your desired 14 days. And become specific sites are not reserved, when you arrive and pick a site there is no need to move twice despite what the “grid” indicated. But it does limit you to making that rez to call center hours/days. Someone very well could book those avail days online (before you can call the rez center when it opens) on Site Y, and if that “fills” the park on those days you are back to S-O-L and either shorten your desired stay or just reserve elsewhere that has that 14 day capability. FYI: Do not ever reserve a tent site thinking it’s jus a site with no utilities! Many are offset areas that have solid site dividers , so renters can be out of the traffic and not in between rigs. Incorrect. You are guaranteed a water/electric spot with an RV rez. If they are at capacity with reservations, you cannot make an online rez and when you call in the rez center is required to advise you that your site will be overflow and for how many days until there will be an open site. If someone fails to show, or cancels, your overflow will convert to a set for however many days ‘opened up’ . If you are in overflow, the park ranger will tell you to check in with them at certain time(s) to see if there was a no show so you can move into the now-available site. You should be more considerate of the rest of the paying membership and not hold onto rez’s that bid up available sites for what you can’t or won’t use…not many can use a day-before window for a vacation, and only locals can actually get there. At minimum you should be courteous enough to cancel as soon as you know you cannot arrive on a date, or are not going at all, not just ‘the day before’. Thanks for the TT experience overview. As empty nesters that are still working and camping 40 to 50 nights a year, we are not ready to commit to a program like TT. I am also very leery of a time-share type of model. We prefer flexibility, state parks, and Army Corps of Engineer parks within a radius of about 300 to 350 miles from home for our long weekend getaways and the occasional 7 to 10 trips. I appreciate your straight forward comments. At some point will take a closer look at programs like TT, Passport America, Escapees, etc. In general, we tend to sign up for a discount membership when we need it. So far by my calculations, Passport America has saved us the most at only $44.00 per year. We only need to stay at two campgrounds to have that amount made up for spending it, and we’ve stayed in dozens to-date. Thank you very much for sharing your experiences with the TT camping pass. I initially did some research on them about a year ago, and also thought TT sounded similar to a time share. Like you stated, some people can make this work for them. Personally, I have always steered away from anything remotely sounding like a time share–or anything where I have to put up a lot of money on the front end. I would much rather stay in campgrounds of my choosing anyway. The monthly rates at independent campgrounds can definitely be a worthwhile option for those looking to bring down their daily camping costs. You are very welcome! And thanks for the kind words.